The electronic version of the manuscript is to be sent to the е-mail: cpee_journal@yahoo.com. Electrical Engineering and Power Industry. Authors are solely responsible for the content of published materials. Submitted manuscripts are screened for plagiarism. Please submit a publication originality statement. We allow our authors to hold the copyright and retain publishing rights without any restrictions. Authors from Ukraine are required to submit additionally an Expertise Act and the text of the manuscript in Ukrainian (2 copies). After review a copy of the review with comments will be sent to the author. A corrected version should be returned to the editor no later than 15 days after receiving the review. Otherwise, the editorial committee may reject the paper or postpone its publication. findings from the conducted research and prospects of further research in this area. The content of the submission must correspond to the journal’s specialization; a paper must be written in English. Illustrative material in the text can be either in colour or black and white. Providing a statement of financing sources is optional. A closing abstract must be written in Ukrainian. If an author does not have a good command of Ukrainian, the abstract will be translated by the editorial board from English into Ukrainian. Please provide a brief describing your acquired education, your affiliation and area of scientific interests as well as your high-quality colour picture. Papers that do not comply with these requirements will be rejected without review and editing and returned to authors for revision. We do not charge our authors with any publication fee. 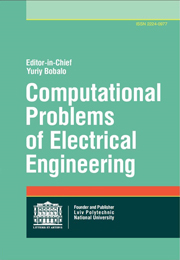 By submitting a manuscript to Computational Problems of Electrical Engineering, all authors agree that all copyrights of all materials included in the submitted manuscript will be exclusively transferred to the publisher (Lviv Polytechnic National University, Ukraine) once the manuscript is accepted. Once the paper is published, the copyright will be released by the publisher under the “Creative Commons Attribution Noncommercial License”, enabling the unrestricted non-commercial use, distribution, and reproduction of the published article in any medium, provided that the original work is properly cited.